Bacon and Fozzie are co-hosting Shopping Around The World on the last Friday of each month. See Bacon's blog for the list of items and other details. Bacon and Nikitaland are hosting Pay It Forward on the first Wednesday of each month. See Bacon's blog for details about participating. Beachnut & Shelldon, Frankie & Ernie are co-hosting the Valentine's Day Parade on 2-14-16. Please see their 1-4-16 post for details. Deadline to enter is 2-5-16. Blogville Awesome Retreat (BAR) is being planned for June 10-12, 2016. Click the link to the blog for all of the details including the meeting location and lodging information. Blogville POTP is a blog created to spread the word and awareness for those in our world who could use our support and Power of The Paw. Click the name and link to the blog to see all posts. Blogville Welcome Wagon is a blog created to introduce us to new bloggers. 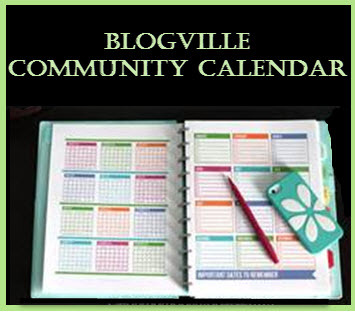 Click on the name and link to the blog to see new friends. Millie & Walter are promoting Save Those Stamps to support a greyhound rescue. See their 11-29-15 post and the tab at the top for details. Collect your stamps and send to them to help out. Murphy & Stanley are sponsoring Everybody Knows Shirley week from 1-25-16 through 1-31-16. See their 1-17-16 post for details. Post about a blogger that surely/shirley everyone should know and join the hop to participate. 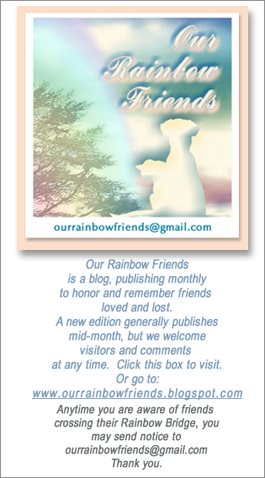 Our Rainbow Friends has posted a Memorial for those who crossed the rainbow bridge in December of 2015. Please click the link to visit the blog and pay your respects. Peaches & Paprika are preparing two Rainbow Bridge Slide Shows for those who crossed the bridge in 2015 and recently. Deadline is 1-30-16. Please contact them at carollowbeerATcomcastDOTnet. Ranger is hosting Inspire Your Heart with StuART on 1-31-16. See his 1-7-16 post for details and on 1-31-16 join the hop with an artistic post to participate. Ranger is reminding us of the Wacky January Holidays. See his 1-1-16 post for the complete listing of the month's special holidays days. 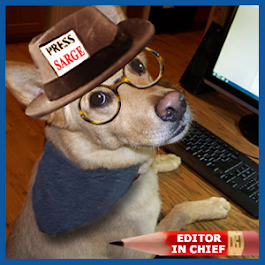 Rascal & Rocco are co-hosting Monday Matters each week on their blog. These posts highlight important animal causes. Sammy hosts a Tuesday Teaser every week on his blog. Link over every week to see the photo and guess the location. 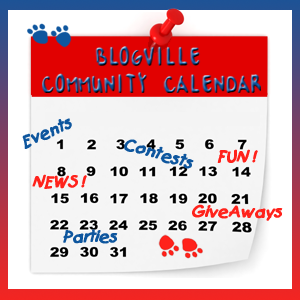 Sugar and Oz are co-hosting a Chewy.com Blog Hop on the 3rd Tuesday of each month. Post your reviews anytime, but the hop is available to join each 3rd Tuesday. 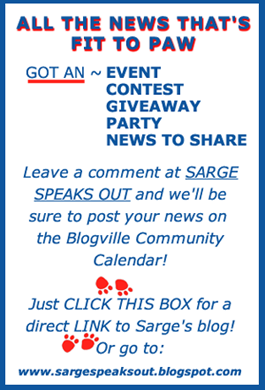 I didn't know about the BCC, thanks Sarge! Thanks Sarge! We are waiting on a storm to start up and then mom will whine about the weather.